Salusbury, Thomas. 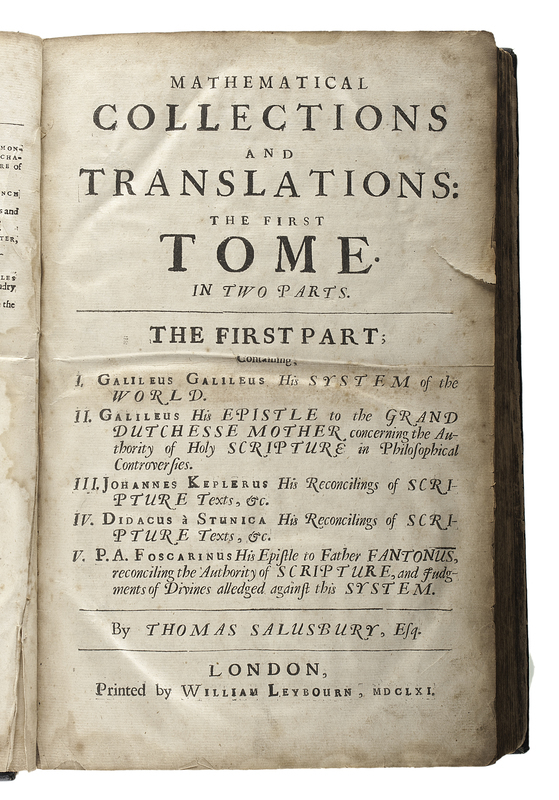 Mathematical Collections and Translations: The First Tome in Two Parts. London: Printed by William Leybourn, MDCLXI (1661). First part consists of Galileo's "System of the World" (Dialogo), his "Epistle to the Grand Dutchesse Mother concerning the Authority of Holy Scripture in Philosophical Controversies;" Johannes Kepler's and Didacus a Stunica's "Reconcilings of Scripture Texts," and Foscarinus' Epistle to Father Fantonus reconciling the Authority of Scripture. First section with separate tp: Galileo Galilei. The Systeme of the World in Four Dialogues Wherein the Two Grand Systemes of Ptolomy and Copernicus are Largely Discoursed of: And the Reasons, both Phylosophical and Physical, as well on the one side as the other, impartially and indefinitely propounded: By Galileus Galileus Linceus, a Gentleman of Florence: Extraordinary Professor of the Mathematicks in the University of Pisa; and Chief Mathematician to Grand Duke of Tuscany. Inglished from the Original Italian Copy by Thomas Salusbury. London, Printed by William Leybourne, 1661 (MDCLXI). Folio (8.5 x 13 in. ); later black cloth (leatherette) (prob. 19th century); [xii], tipped in frontis of Galileo, 424 numb. pages, plus 4 plates, one at end of each dialogue and illus. in text. New tp: The Ancient and Modern Doctrine of Holy Fathers, and J(I)udicious Divines, Concerning the rash citation of the Testimony of Sacred Scripture, in Conclusions meerly Natural, and that may be proved by Sensible Experiments, and Necessary Demonstrations.... And now rendered into English from the Italian by Thomas Salusbury. London, William Leybourn, 1661. New tp at p. 471: An Epistle of the Reverend father Paolo Antioni Foscarini, a Carmelite; Concerning the Pythagorian and Copernican Opinion of the Mobility of the Earth and Stability of the Sun; and of the New Systeme or constitution of the World. In which the Authorities of Sacred Scripture, and Assertions of Divines, commonly alledged against this Opinion, are Reconciled. Written to the Most Reverend Father, Sebastiano Fantoni, General of the Order of Carmelites. Englished from the Original, by Thomas Salusburie. London, William Leybourn, MDCLXI (1661); pp 473 - 503; colophon; [xxiii] Index ("A Table of the most Observable Persons and Matters Mentioned in the First Part of the First Tome."). Separate tp: Mathematical Collections and Translations: the Second Tome. The Second Part;... By Thomas Salusbury, Esq. London, William Leybourne, MDCLXI. (with list of the 4 parts contained within, the first two also having their own tps); errata for Part II facing tp, [xii], 118 numbered pp, [v]. Should be "First Tome, Second Part." There are a few errors in the typesetting of this volume, but all pages are present. Pages 70-75 numbered 70-71-7222-74-74-75; page 290 with "274" on verso of p. 289; pages 306 - 230 - 308; page 354 is set as 345; page 253 should be Dialogue III, not II, in header; page 389 with Dialogue III in header, even though it is in IV; and in second part pages 14-17-16-17. Throughout, on various title pages, there is the typical variation in spelling of Salusbury/Salusburie and Leybourne/Leybourn. This was the first translation of Galileo's work and was very influential in the English-speaking world. He set up his argument as a discussion between a proponent of Copernicus' model of the solar system/universe (Salviati), a follower of Ptolemy and Aristotle (Simplicio - likely also a play on words, implying simple-minded), and a neutral intelligent layman (Sagredo), who becomes convinced of the correctness of the Copernican view as the discussions continue over four days. The discussion touches on many topics other than astronomy, both as part of the main debate and also as examples of what Galileo considers good science. He also attempted to use tides as a direct argument for the Earth's motion, an argument that did not work as well as Galileo had hoped, but seemingly explains the addition of the second part of the tome, "Of the Mensuration of Running Waters." This part was written by Benedetto Antonio Castelli (1578-1643), a student, friend and supporter of Galileo, and, later, teacher to his son. Castelli was a Benedictine monk, as the first name indicates, and also a friend of Pope Urban's. Yet, Castelli was never arrested for heresy, and, indeed, became abbot of the monastery at Monte Cassino, yet he held similar views to those of Galileo. Galileo's arrest has more characteristics of politics than conflict between religion and science. There have been a number of suggestions as to what those factors may have been (an insult to the Pope, conflict between the Pope and the Duke of Tuscany, etc. ), but none yet definitive. Condition:Spine ends worn to text block. Lower corners slightly worn. A bit of a bend to upper board about 1/3 of the way from the spine. Page edges moderately toned. Scattered foxing and damp stains (as most volumes acquire in 450 years!). Accompanying images illustrate range of condition. There is a large water stain in second part covering most of the pages 5-8; 13-16; 21-24; 29-32; 37-40. The stains get lighter, although they cover nearly the same area of the leaves (i.e. same spill). It would appear that the spill happened while the pages were stacked at the printer's/binder's since the intervening leaves do not have the water stain. Three small holes appear to be imperfections in the paper: page 37/38, only affecting a couple letters; through the numbers on 319/320; and in margin of plate after first dialogue. The last couple of leaves are nearly separated, but are present. The only pages that appear to be missing are a half-title(?) and the errata to the first part.